Patriot Memory, a global pioneer in high-performance memory, NAND flash, storage, and enthusiast computer products today announces the launch of their Extreme Performance SDHC/SDXC UHS-I flash storage. Featuring ultra-fast transfer rates and expanded storage capacities, the Patriot Memory EP Series SDHC/SDXC cards are perfect for stunning high resolution digital photography and increased high definition video recording times. Designed to provide twice the transfer speeds of previous Class 10 solutions, when used with UHS-I compatible devices, the Patriot Memory EP Series SDHC/SDXC cards deliver the performance necessary for capturing and broadcasting in true real-time. With capacities of up to 128GB, these EP Series SDHC/SDXC cards offer a greatly improved maximum volume when compared to standard SDHC solutions. 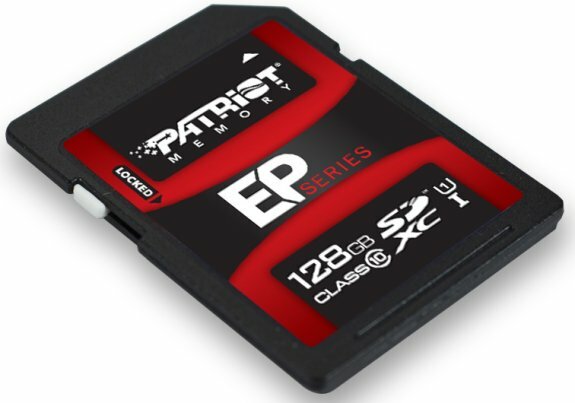 At the 128GB capacity, the Patriot Memory EP Series SDHC/SDXC card is capable of storing up to 2,560 minutes of 1080p video and well over 26,000 high definition photos. Read and write speeds of up to 50 MB/S (read) and 35 MB/S (write) when used with a UHS-I compatible device.